Handy list of websites that will help you teach your kids to be safe and responsible users of the Internet, social media, and personal technology. Make sure your child knows how to stay safe online and what your expectations are. 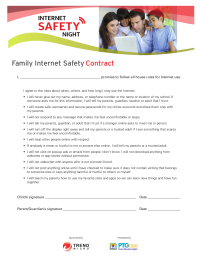 This contract should be signed by both child and parent, and includes rules about safety as well as behavior while on the Internet. The first step in Internet safety is communication, and parents play a critical role in making it ongoing. 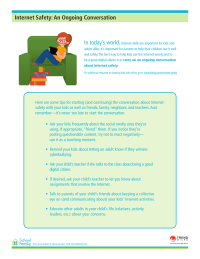 Here are some tips for starting (and continuing) the conversation about Internet safety with your kids as well as friends, family, neighbors, and teachers. 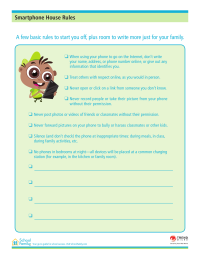 The first step in Internet safety is communication; get the conversation rolling by talking about your family's "house rules" for smartphone use. A few rules are included to start you off, plus some extra space to write more just for your family.